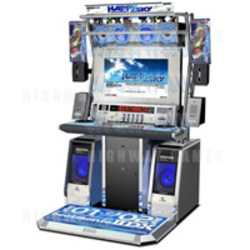 Beatmania II DX Happy Sky is the 12th edition in the Beatmania II DX series of music / DJ machines. It has 45 new songs, bringing the song total to 350. Beatmania II DX Happy Sky also sees the difficulty system rescaled from a 1-8+ scale to a 1-12 scale. Light7/Light14 modes were renamed normal, and the 7Keys/14Keys modes were renamed hyper. Beatmania II DX Happy Sky also introduced a variety of new modifiers, with the Hidden+, Sudden+, Hidsud+ and S-Random modifiers all seen for the first time. The Beatmania IIDX cabinet controls consisting of two turntables, and two keyboards each with seven keys. This is a main difference between the original Beatmania and the Beatmania II series, with the Beatmania keyboard only consisting of 5 buttons per player. Other notable features of the Beatmania IIDX cabinet are the widescreen 16:9 display; and the powerful speakers and bass platform that vibrates beneath the player's feet.